Yoga has been one of the best additions to my weekly routine, bringing calm and mindfulness but also building strength and fitness…oh, and I seem to have also lost a few wobbly bits that running never seemed to budge! At the start of the year, I went to a couple of very relaxed and somewhat introductory yoga classes. These were in Sorrento on the Mornington Peninsula whilst on holidays. These were amazingly scenic being held on the old grassy helipad overlooking the bay. We were blessed with some gorgeous blue skies, still and warm mornings. This made the very simple yoga classes a relaxing introduction. But it was soon back to Melbourne for start of the year. Back to the normal grind of daily business and routine of running busy kids around. Fast forward 5 months and after my running partner became injured, I turned to yoga as I found running solo a difficult commitment over Melbourne’s cold winter. Yoga is definitely not as easy as it looks! Classes at KX Yoga were very different from my previous experience. Indoors in a 30-degree studio was comforting as the temperature dropped outside. However, I soon found that the Vinyasa Flow classes were much more demanding. By the end of the first class, I was dripping with sweat! I am not normally a “sweater” but I had obviously worked hard! I used different muscle groups which must have been lying dormant for many years and tested undiscovered strength by holding positions and poses for extended periods. Do you know how hard it is just to hold your arms in a horizontal position for minutes on end? Despite cramping in my feet arches and shins at times from the balance work, bending and twisting into positions unknown, I became drawn to the challenge of this whole new body workout! Yoga is union of the body, breath and mind. It involves the discipline of combining these in a series of postures and movements, breathing and meditation. In addition to the warm and inviting studio, the class experience is definitely driven by the instructor. Making a real difference to my development are instructors Eva and Joey. Both are very different in their styles but assert their individual warm, gentle but vibrant personalities to offer a challenging yet calming experience. They always have something to offer like a positive thought or subtle reminder to take away into your day. The friendly studio owners, Sarah and Ian, also provide the added benefit of an assistant instructor to many of their classes. This is great to ensure correct technique. As a newbie, I was surprisingly not intimidated in any way as the instructors create an inclusive environment. 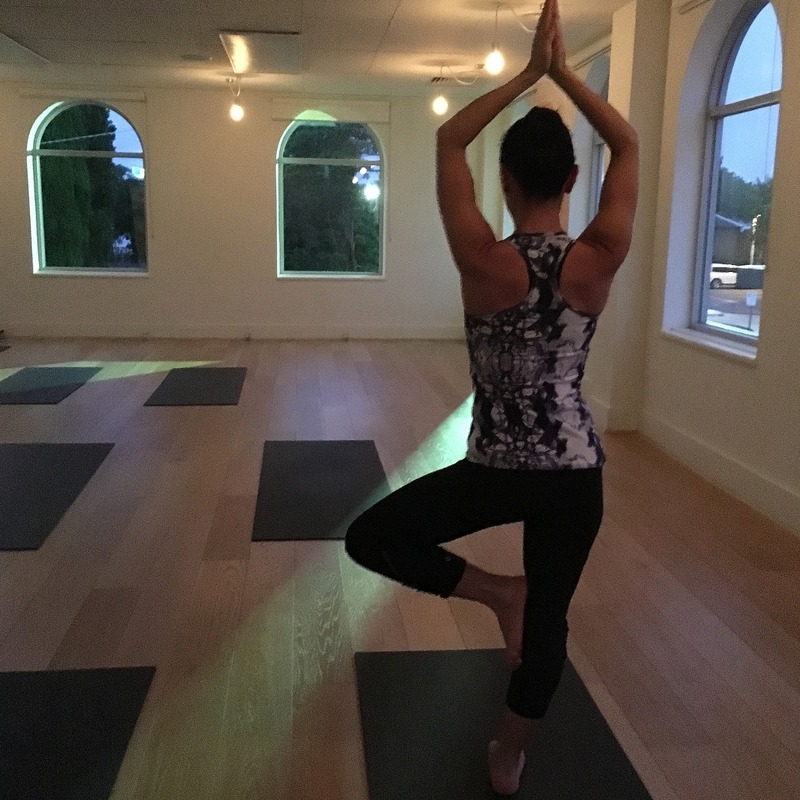 Emphasis is on yoga as an individual and a non-competitive activity, progression at your own pace, and that each person is on their own journey. I love this relaxed attitude, something we can all bring into the rest of our lives. Yes, some of the fancy names for the moves and poses can be a little intimidating and hard to remember at first. But just following the person in front of you works fine! I have since introduced two running buddies to yoga and they have now converted yogis too. It is amazing how great yoga is for glute activation! My eldest daughter is also loving yoga, so much so that she has committed to waking up at 5.30am once a week to get in an early morning session before school in addition to her already full schedule of athletics and triathlon training. But it’s definitely worth the challenge! Yoga has brought a grounding and balance to my life over these past months. After class, I can feel completely relaxed and calm or fully energised depending on the particular class. Either way, I feel great which is why I have just committed to the KX Yoga 21 Day challenge which started for me at 6am today! Need to find a good yoga practice near me to give this a go. There are lots of local yoga studios, just give one a try. I will also ask about any recommended online or yoga videos and let you know.